The farm is located at 3400 Washington Fields RD, Washington, UT. Directions can be found HERE. What do you do with all your cows? We raise commercial beef cattle. How long has the farm been here? We are a sixth generation family farm, so, forever! How can I apply to work on the farm? Online HERE. Applications and auditions for the Fall season begin early in August. It depends on our season. Click HERE for our current hours. How many people visit the farm each year? Our average is 30,000 in October alone! It varies every year, and every year we get bigger! Do you grow things on the farm? Yes! Corn, pumpkins, straw, feed for our livestock, and a full vegetable garden. Is everyone who works here family? 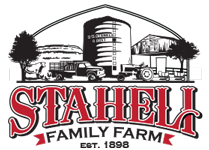 We consider everyone who works here family; however, they’re not all related by the Staheli name. Is the farm open year-round? Sort of! We hold special events throughout the year. In December we offer a Live Nativity, in the spring we have an Easter Celebration/Egg Hunt, and in the summer we put on “Farm Camp!” Always check back on our website for more info. We are in the MDT time zone. If you are traveling from out of town, please plan accordingly. What should I wear on the farm? Where should I park on the farm? There will be a large parking sign. Please pull in and ONLY PARK in our designated parking lot. Cars that are parked on the road at any time will be towed at the owner’s expense. Do you have a real pumpkin patch? We do! Pick, weigh, and pay for your pumpkins at the patch. For more information click HERE. Yes, but for safety reasons, you may ONLY drop off and pick up IN OUR PARKING LOT, NOT ON THE STREETS!! Here’s a question for YOU>>>Why not make a memory and join your kids for the food, fun, and entertainment? Is there a place to eat on the farm? Yes! We have our food concessions. For more info please click HERE. What if it’s raining? Will the Farm be open? Why do you have witches at the Farm? They just seem to love it here, and they add a lot of fun “Halloween spirit” to the Farm. They are all nice, we promise (until they get hangry)! Get to know our witches, HERE. How will I know if Wick’a Dee Witch will be at the Farm? Please check our Fall Season Calendar page, HERE. When will there be live/loud music or other entertainment? You may! The farm is dirt and the corn maze is bumpy. Please come prepared. With prior special permission only. Please use contact form at bottom of every page on our website. Can I bring my pets to the farm? We love animals; however, we do not allow any to enter our farm (Only service dogs allowed). Do you allow rock hiding at your farm? Yes, with paid admission for hiders and seekers. Which areas of the Farm are wheelchair accessible? The Farmland, Pumpkin Patch, and Corn Maize are wheelchair accessible. Some attractions in the Farmland are not (Pirate Ship, Dirt Mountain). The Field of Screams is not wheelchair accessible. What are the current pumpkin prices? Our pumpkins are weighed at 39 cents per pound, unless otherwise noted at the Pumpkin Patch. Is there somewhere close by to stay at a hotel/campground/RV? We suggest the “Holiday Inn” in Coral Canyon. What else is there to do in the St. George area? Southern Utah is filled with fun activities for the whole family! Visit sgcity.org and washingtoncity.org and St. George Utah Events for more info! 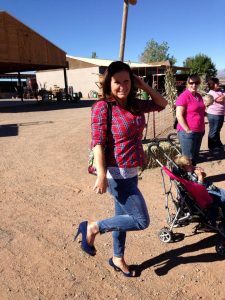 “Blue Suede Shoes” are welcome, but not practical! Find Sherrie and ask! Or, search for videos on YouTube. It’s a very complicated, scientific, agricultural process. Yes, our phone number is on the map given before you enter the maze. We also have “corn cops” to help if you get really lost! Why is it called the “Corn Maize”? Two reasons: First, it’s a play on words (another word for “corn” is “maize”); second, we work closely with a company called TheMaize. Is the Field of Screams really scary? Who can go through? We don’t have an age limit… however, we STRONGLY suggest those that are 12 years or older only. We also don’t suggest going through if you are pregnant, have a heart condition, or any sort of injury. Seriously, it’s scary! For more info please click HERE. Are the lines really long? No, not anymore! With any Field of Screams admission or Season Pass, you will be issued a “Tractor Time” pass. It lists the time you should arrive at the tractor for your ride to the attraction. You’re now free to enjoy all the Farm has to offer! We also offer VIP Passes, which get you to the FRONT OF THE LINE to the Field of Screams and/or Corn Maize. No, flashlights are NOT allowed in the Field of Screams. You can purchase them online HERE, or at the Ticket Booth. You can purchase them at the Ticket Booth, Pumpkin Patch, or Chuck Wagon Diner. Tokened attractions do not open until 5 pm daily, 1 pm on Saturdays. No, and there are NO EXCEPTIONS! Can we bring our church, scout, or school group? Where can I book an event? You can only book an event online HERE. Please do not come to the farm to book your event. Where can I find information about birthday parties and weddings? Birthday Parties HERE. Weddings HERE. Wedding events are NOT scheduled during the months of September or October; there’s just too much fall fun going on! Please fill out our Field Trip form HERE. If I use the contact form, but don’t get a fast response, what else can I do? Sorry! Sometimes our busy farm life keeps us, well, busy! Try messaging us on Facebook, HERE. With prior special permission only. Please use contact form at the bottom of every page on our website.